Wait, Why is Alejandro Villanueva Apologizing to His Teammates and Coach? “They’re getting negative feedback because they didn’t stand up for the national anthem when in reality, they would’ve done it. They were fighting to stand up for the national anthem.” He also made a point to say that he did not take offense to players who have chosen to take a knee during the anthem in protest of “injustices and racial divide,” including former 49ers quarterback Colin Kaepernick, who knelt for the anthem in protest of police brutality and racial injustice last season. “I take no offense,” Villanueva said. “I don’t think veterans at the end of the day take any offense. They actually signed up and fought so that somebody could take a knee and protest peacefully whatever it is that their hearts desire.” Continually, Villanueva apologized to the rest of the team. “I made coach Tomlin look bad, and that is my fault and my fault only,” he said. “I made my teammates look bad, and that is my fault and my fault only. This looks like a bona fide miscommunication, as other photo angles have shown Steelers players and personnel standing during the anthem just inside the tunnel, some with hands over their hearts. 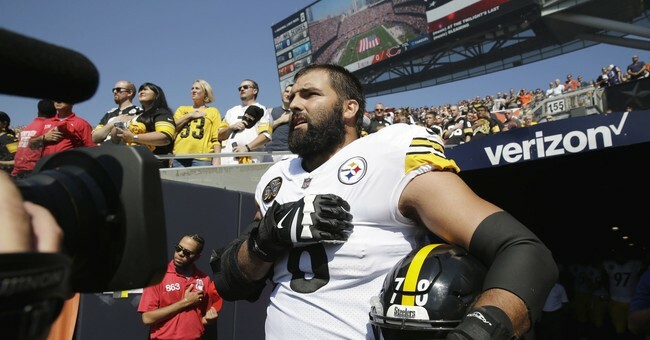 Based on Villanueva's account, he was urged by wounded vets to take a stand for the anthem, so he asked to alter the team's previously agreed-upon plan to stay in the locker room -- and then screwy logistics in the moment led to him standing alone on the field. The guy feels like his actions unintentionally made his coach and teammates look unpatriotic, which was not his intention, so he's expressing regret and clarifying. I find it very hard to believe that a decorated warrior would be cowed or pressured into apologizing for doing something in which he manifestly believes quite strongly, so I trust his story. It's still rather dispiriting to see someone like Villanueva, whose intentions were pure, and who has literally earned the right to salute our flag and anthem however he likes, knocked onto the defensive over what he did. By the way, Tomlin still doesn't get a pass on this, in my book. Even if he felt burned and frustrated over Villanueva and the snafu, he should have had the awareness and class to say something like, "I think there was a miscommunication within our locker room about how everything went down, and we'll make sure we're all on the same page in the future -- but we obviously all respect the hell out of him, and we cannot thank him enough for his brave service to our country. Watching him singing our anthem reminds us all what's truly great about America." But that's not what Tomlin did; he took some passive aggressive swipes about a lack of 'respect' and grumbled about a lack of unity behind the team's decision. Very low marks for misplaced priorities and poor leadership. I was unable to sleep last night and want to share my thoughts and feelings on our team’s decision to remain in the tunnel for the National Anthem yesterday. The idea was to be unified as a team when so much attention is paid to things dividing our country, but I wish we approached it differently...As a team, it was not a protest of the flag or the Anthem. I personally don’t believe the Anthem is ever the time to make any type of protest. For me, and many others on my team and around the league, it is a tribute to those who commit to serve and protect our country, current and past, especially the ones that made the ultimate sacrifice...Moving forward, I hope standing for the Anthem shows solidarity as a nation, that we stand united in respect for the people on the front lines protecting our freedom and keeping us safe. God bless those men and women. Throughout this tempest, Villanueva has come across as a stand-up guy who respects and loves both his country and his teammates. Good on him for becoming an overnight inspiration to so many fans, as reflected in a big spike in his jersey sales -- even if the game he plays is taking public relations and ratings hits as a result of these politicized spectacles.